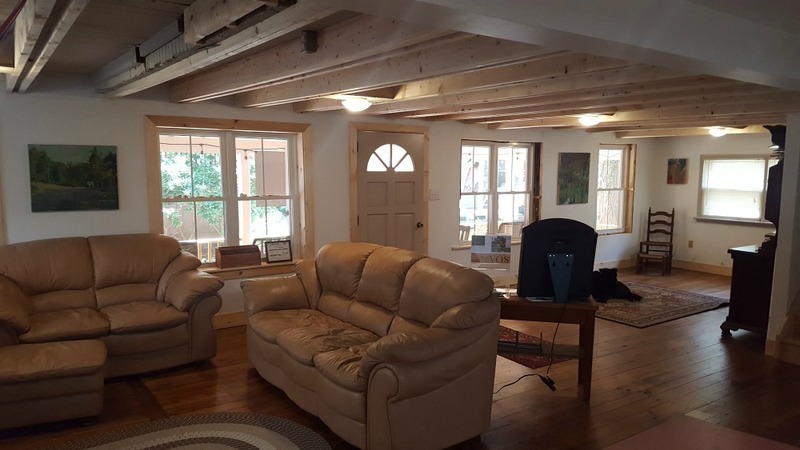 These images are of the large common area of the cottage. Small bedrooms are located upstairs, and there are two bathrooms. Residents of the Artist Cottage live "family-style" taking mutual responsibility for chores and sharing meals together. Common sense house rules ensure fair distribution of responsibilities. The cottage receives a local farm share of fresh fruits and vegetables each week. This shows the shared kitchen area. Bedrooms are up the stairs at left. This image shows another view of the common area.